3. A, C-axis drive mechanism is used D.D permanent magnet motor design, without the traditional mechanical transmission and backlash caused by worm gear, A-axis positioning accuracy up to +/-5 SEC, C-axis positioning accuracy up to +/-3 SEC. 4. Spindle head is balanced by two self-aligned hydraulic cylinders, spindle locates at the center of the two counter balancing cylinders, Z driving ball screw and spindle head, such optimal design to reduce the unbalance force to minimum and to ensure accurate positioning for years. 5. 3-way bed (X-axis) design is composed of 3 roller type linear ways. This design enlarges the table dimension to improve the loading capability, to keep high dynamic level accuracy, and to provide the best feeding rigidity. 6. Guide ways are designed with optimal span to carry the table, box-shape bed with strong V-shape enforced ribs allows heavy work piece load. 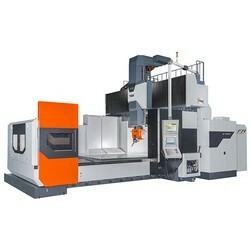 7.One piece casting with square shape headstock leads spindle to be close to the Y Guide way reduces the unbalanced force to minimum, provide better heavy cutting ability. 8. The best center-line layout of spindle system, spindle is close to the Z guide way, reduce the unbalanced cutting moment and offset of thermal expansion to minimum. 9. Y-axis ball screw is driven through gear ratio 2:1 timing belt, and X-axis ball screw is driven by gear to ensure torque transmitted, and spindle of Z-axis is driven directly (for box way) to create higher acceleration/deceleration rate of the feeding system. 10. Self-alignment twin hydraulic counter balance cylinders with quick response air accumulator design provides smooth and fast acceleration/deceleration of the Z axis movement.